Leaving LAX (Los Angeles) just before midnight, and connecting to an early morning flight in Chicago, I arrived in Flint, Michigan, around noon local time. 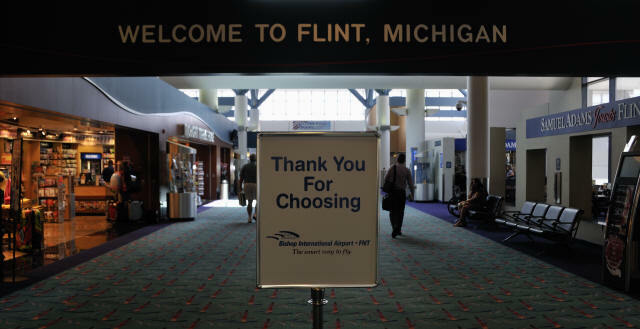 Flint is a small town one hour (drive) north of Detroit. 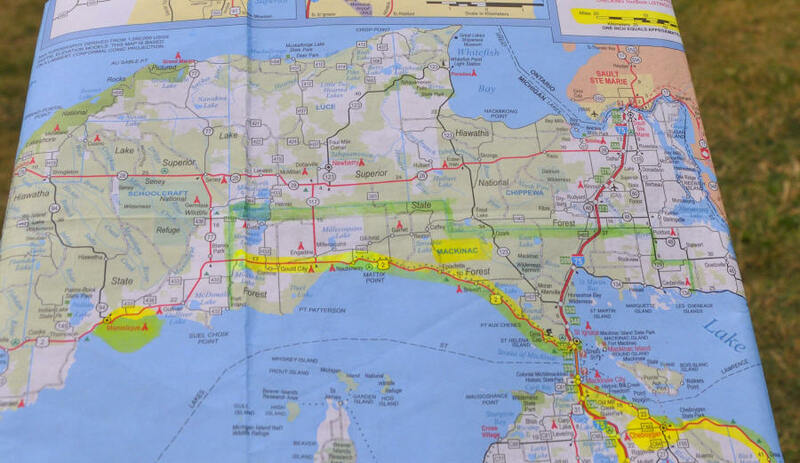 My destination is the northern tip of the Lower Michigan Peninsula, and perhaps, the southern part of the Upper Michigan as well. This is the first time I am visiting the Upper Michigan. I got a Ford Focus from Budget at the Bishop International Airport. 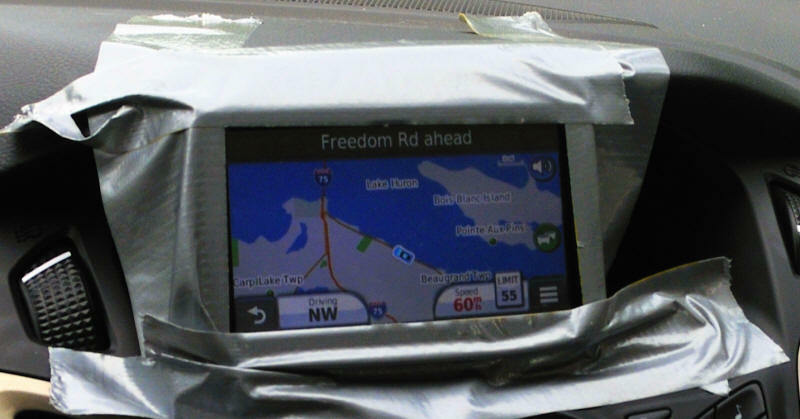 I "pasted" my GPS securely on the dashboard of my bright red Focus. 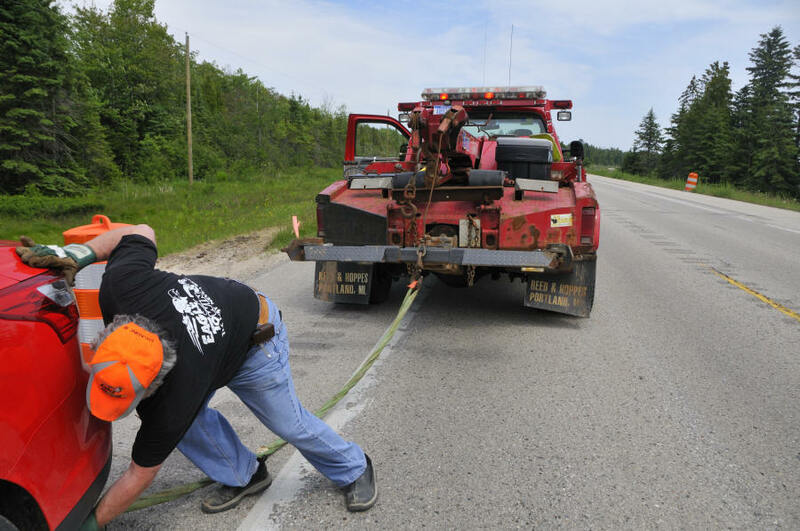 I have to drive 400 miles. 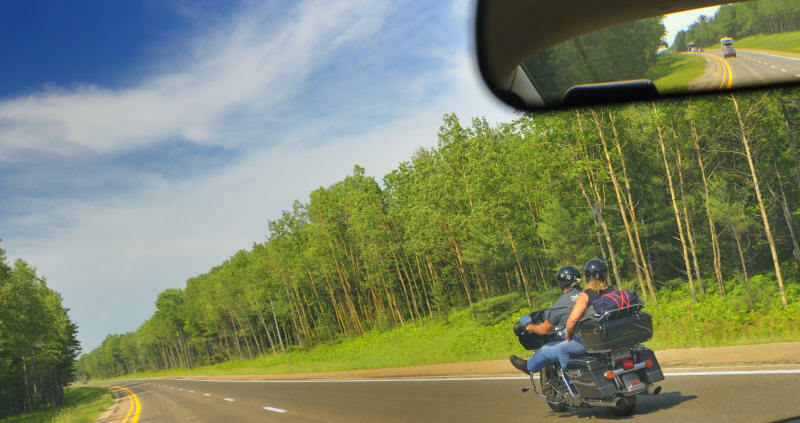 I hit the road north. 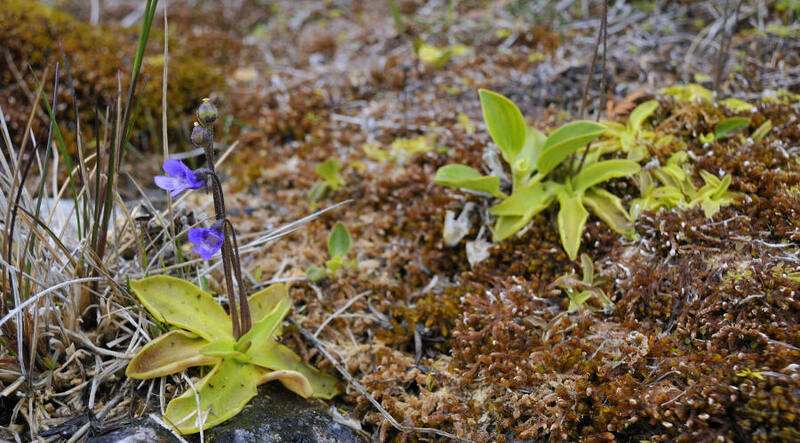 The main objective of the trip was to capture the blossoms of Pinguicula vulgaris. 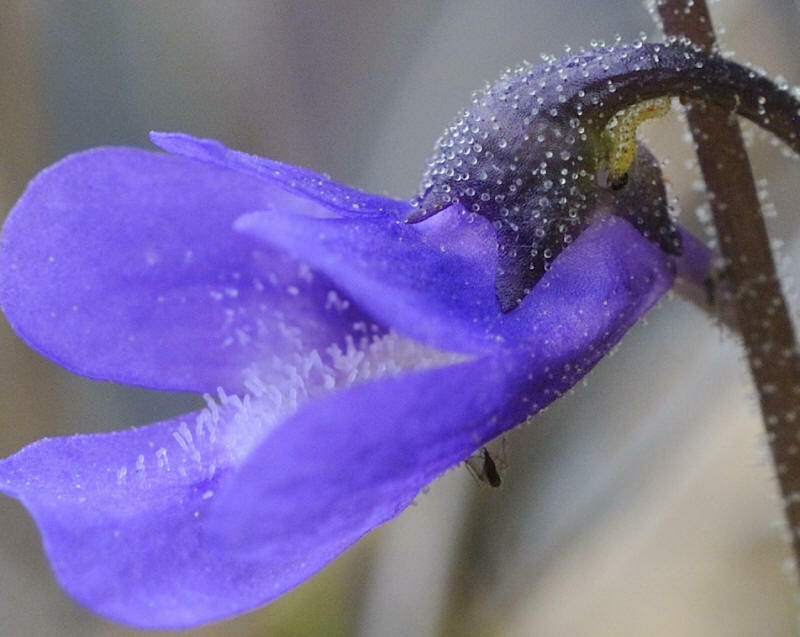 I was a bit late for the peak of flowering, and only a few purple corollas were seen. 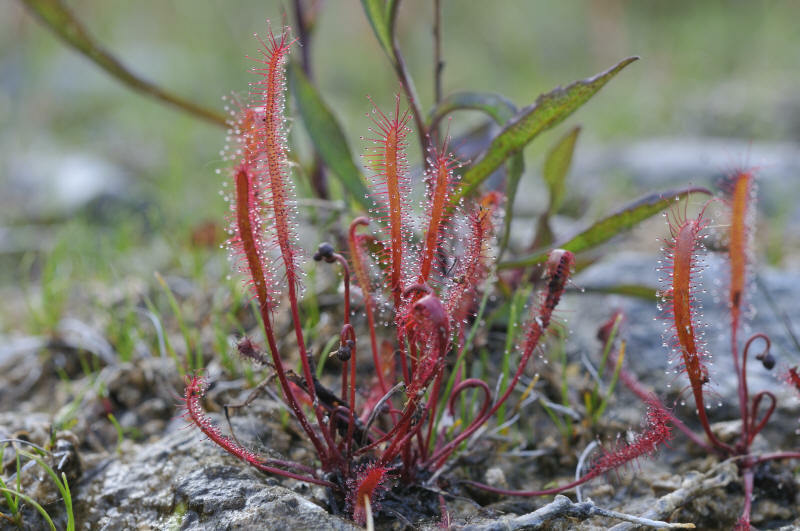 I found a colony of Drosera linearis in the same lakeshore. 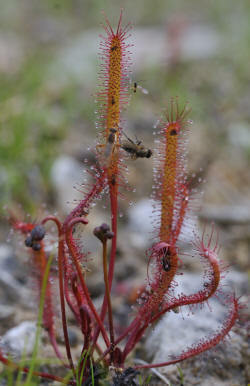 No doubt that Drosera linearis is a far more effective insect catcher than Pinguicula vulgaris. 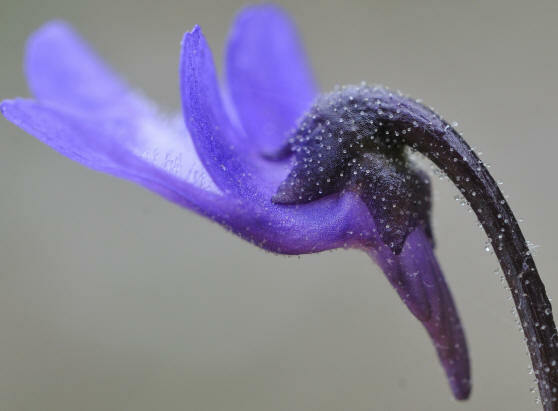 A purple flower is born in a pendulous position on a slender, glandular scape. The five-lobed calyx is also covered with glandular hairs. 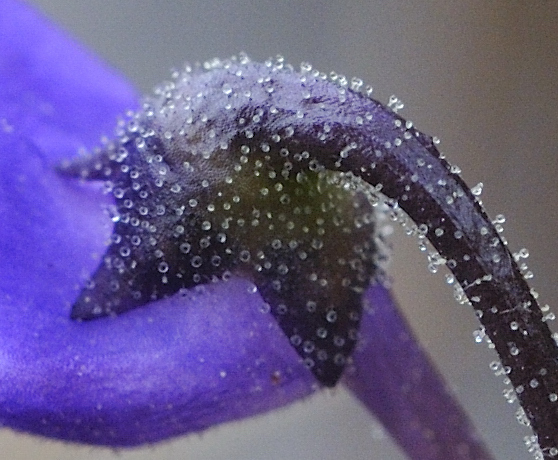 Small insects are often seen caught in these mucilaginous secretions. 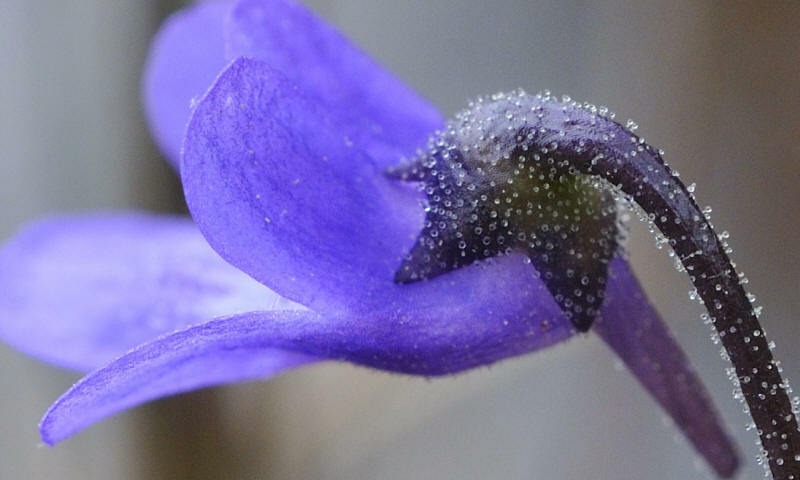 The glue appears to be just to protect the flower from insect pests since no digestive glands are found to utilize the catch. Note the incision of the calyx lobes. 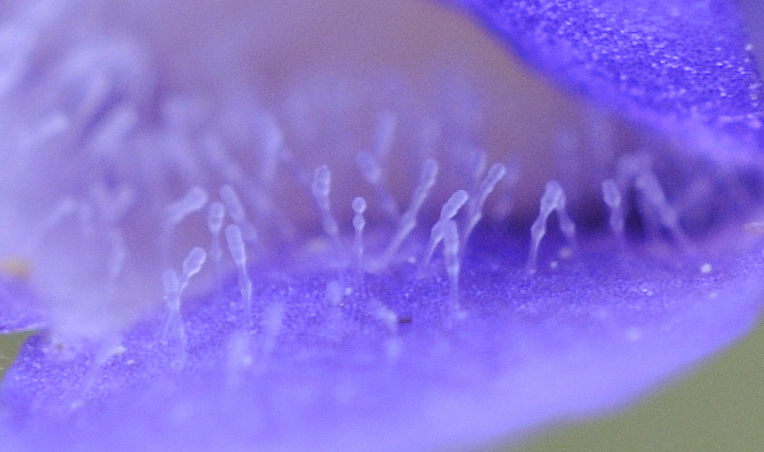 Hairs on the inner surface of the corolla offer a diagnostic character for the species. 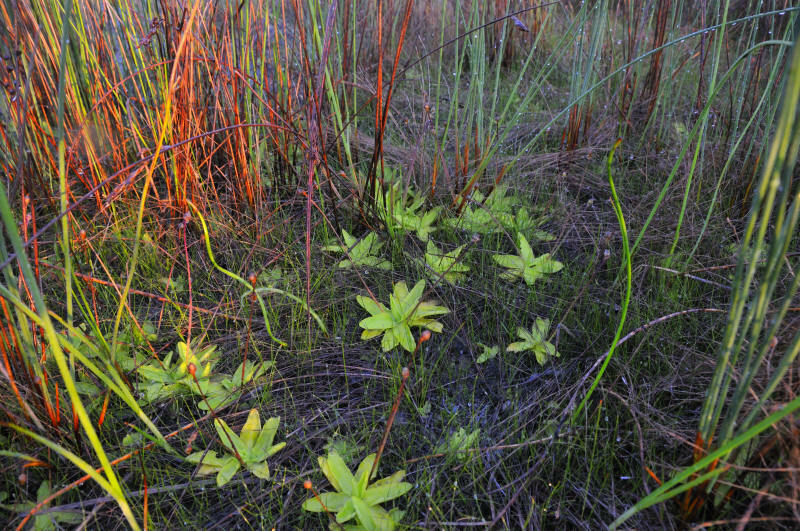 The flower stalk (scape) grows further after fertilization, as it straightens itself from the crooked posture. 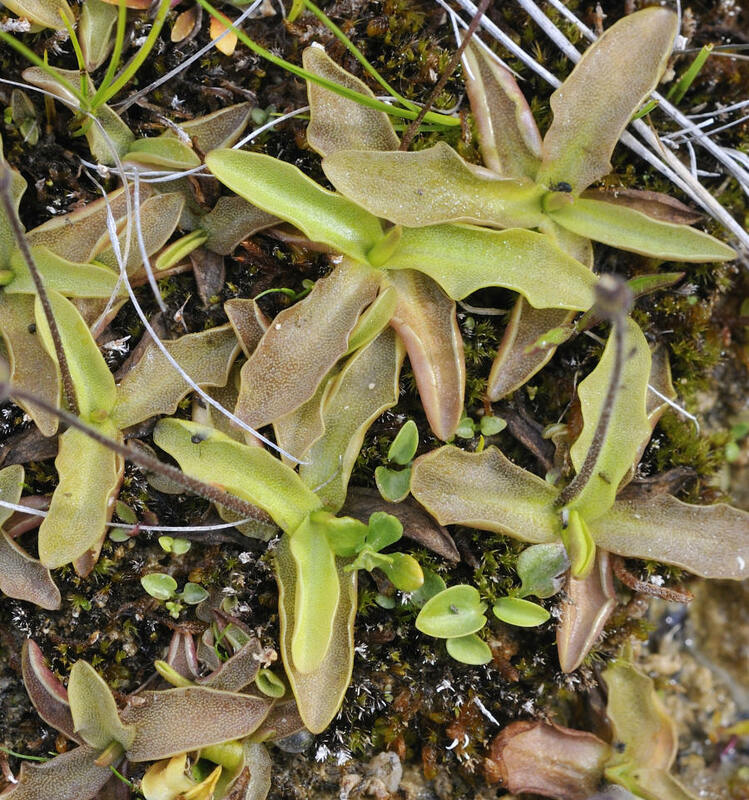 Note a strong brownish coloration of leaves in this colony of Pinguicula vulgaris. 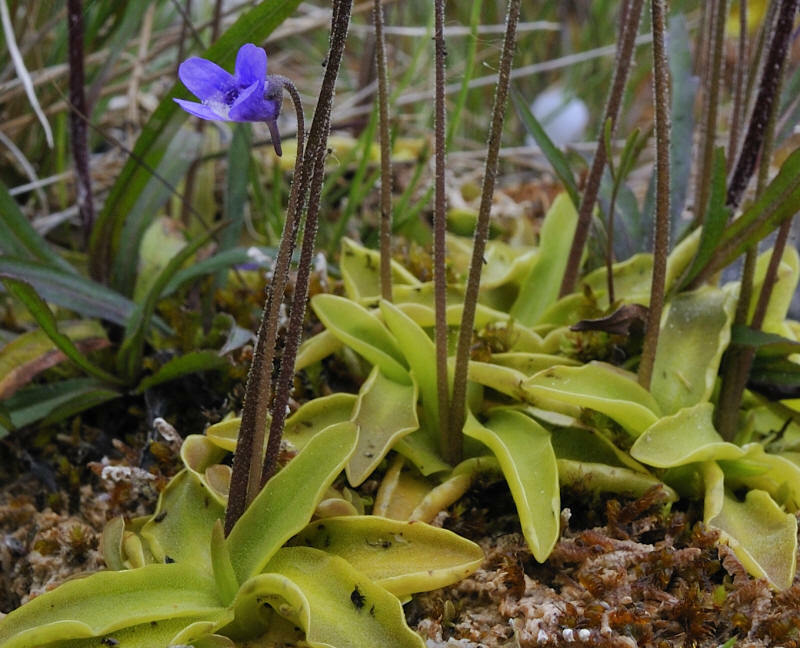 Similar leaf color variants are quite common in Pinguicula macroceras populations in the northwest (Oregon & California). 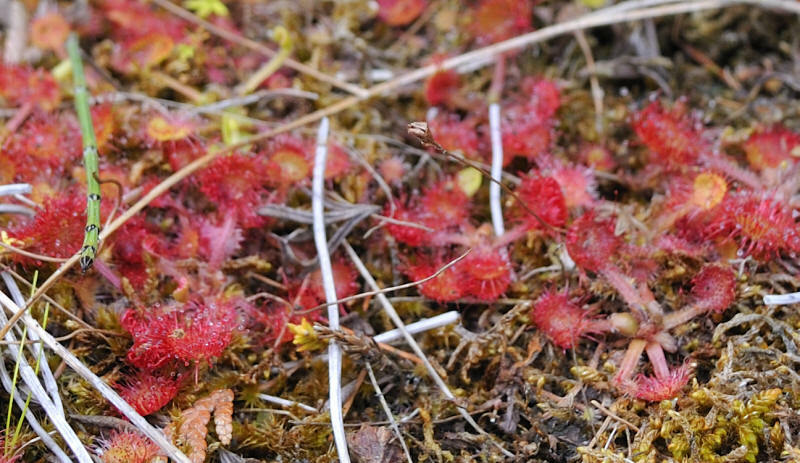 A colony of Drosera rotundifolia alongside Pinguicula vulgaris. 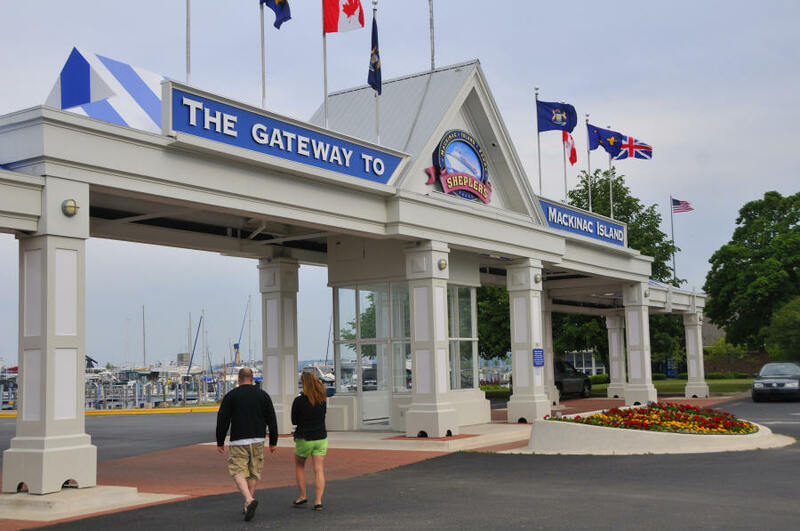 You can take a Mackinac Island ferry to the island. Mackinac Bridge connecting to the Upper Peninsula, looking north. 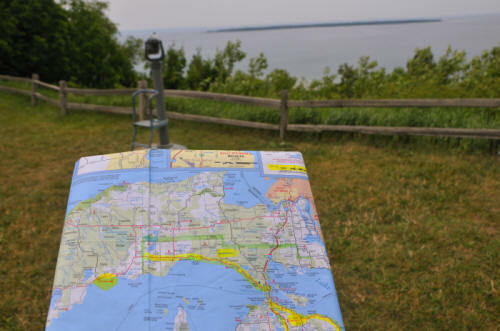 From the Upper Michigan (scenic rest area on Route 2) overlooking Lake Michigan to the south. 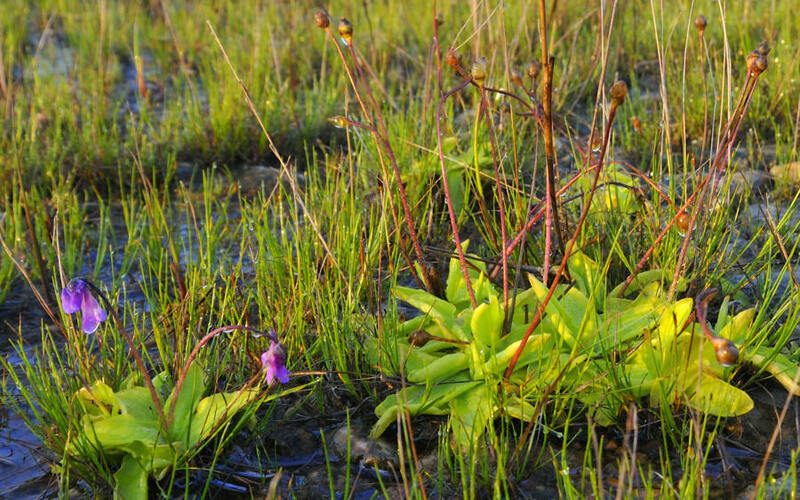 I was looking for Pinguicula vulgaris along the shores of Lake Michigan. I did not find any. 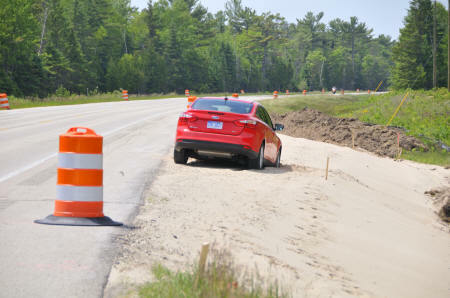 Instead, my car got stuck in the sand, near the town of Epoufette along Route 2. 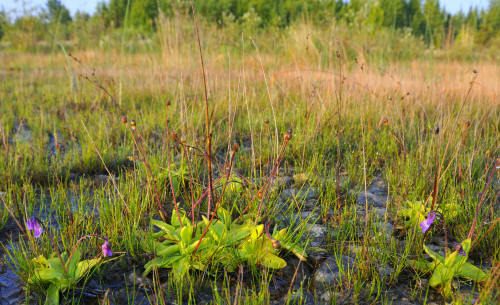 No carnivorous plants and a little discouraged by the incident, I decided to go back to the Lower Michigan Peninsula. 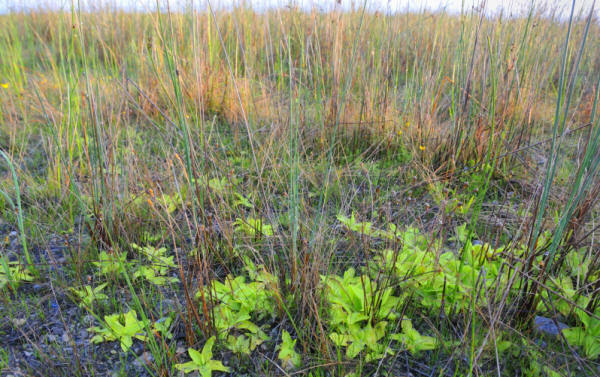 Wilderness Park Nature Preserve. At 5:30 in the morning. I came back to the lakeshore early in the morning. It was light but the sun was yet to rise. 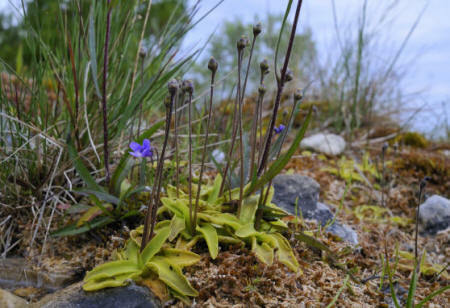 Late in the season (for flowers) and with a violent rain storm the previous night, the flowers of Pinguicula vulgaris were pretty much done. At 6:30 am, the orange sun appeared over Lake Michigan. 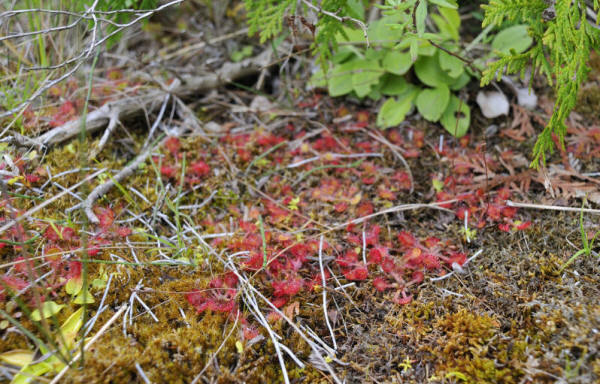 Dry grasses started to glow in red, creating a sharp contrast to the green rosettes of Pinguicula. 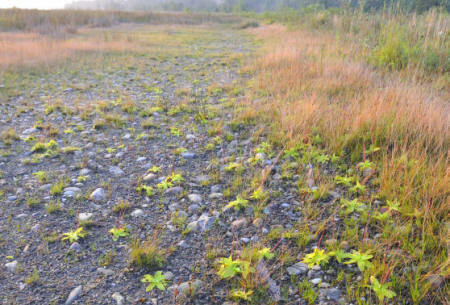 Yellow flowers of Utricularia cornuta covering the field along the shores of Lake Michigan.